« 7th Annual African Diaspora International Film Festival — Washington, D.C.
MOSCOW (TADIAS) – History was made in Russia’s Luzhniki Stadium as an Ethiopian made the podium in the steeplechase at a global championships for the first time ever on July 31, 1980, when Eshetu Tura took the bronze medal at the Moscow Olympic Games. 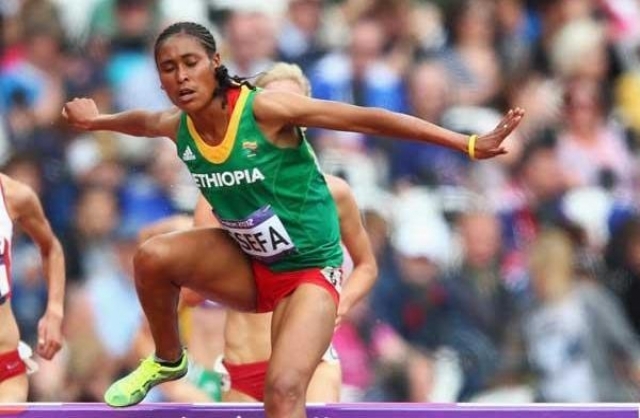 Thirty-three years later, history repeated itself when one of his athletes, Sofia Assefa, also took steeplechase bronze in the same stadium at the 2013 athletics world championships on Tuesday night, becoming the first Ethiopian — male or female — to medal in that race at the biennial event. Sofia’s accomplishment in Moscow was made all the more dramatic after she fell at a jump during the race and recovered to finish in 9:12.84 behind Kenya’s African champion Milcah Chemos and national champion Lydia Chepkurui, who ran 9:11.65 and 9:12.84. Sofia was quickly dropped by the leading four runners and overtaken by Kenya’s Hyvin Jepkemoi, leaving her adrift in sixth place. “But I just kept going, thinking that I’ll leave with whatever God gives me, whatever I get,” she said.